Staying organized in your optical dispensary is key to keeping a clean and professional image as patients come and go. 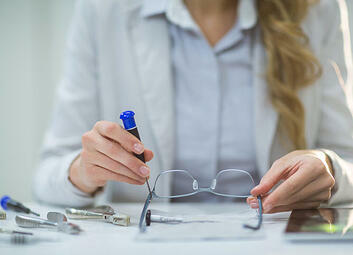 Organization is also key for opticians to be efficient as they work to fix and adjust frames for patients. We all know that frame parts and tools are small and easy to lose. So how do you keep your optical dispensing workstation organized so it's easy for you to quickly make frame adjustments without losing any pieces along the way? We've got a list of solutions and tools to help you make better use of your optical workstation. Let us know in the comments if you have a successful method for organizing your workspace. Let's start with something easy that just about everyone has lying around already. A towel can be a great workspace for making small frame fixes. Simply roll it out when you're ready to work and the texture of the towel will help keep small tools and pieces from rolling around or falling to the floor. It's also easy to fold up and store when not in use. Depending on the look and feel of your dispensary, a wooden workstation might match your decor and office vibe. Wood may not be the easiest surface for your workspace, but a cutting board with a trough might help you overcome the challenges of keeping small pieces from rolling off your workstation. This last recommendation won't necessarily help with workspace organization, but we thought it was a tool worth mentioning. The bionic thumb is a handheld tool to help with frame bending. It's an affordable device starting at just $25, so it's an easy addition to any workstation. Once your work station is set up for efficiency, download our 4 week guide to bigger profits in your dispensary.